One of the largest and most popular festivals in India (and that's saying something), the Pushkar Camel Fair, or Pushkar Mela, takes place far away from the hustle and bustle of Rajasthan cities. 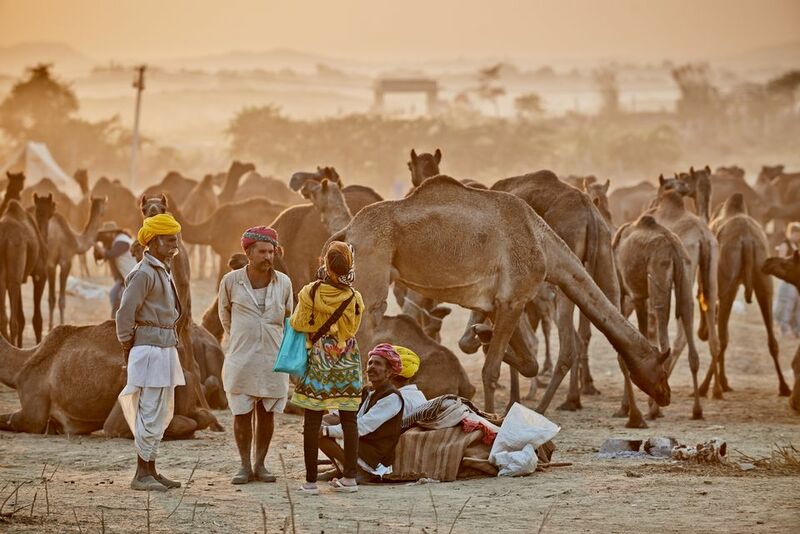 Thousands of camels, horses, and cattle descend on the sand dunes of Pushkar to be traded by villagers and tradesman and witnessed by worldwide travelers. This festival is as much of a business venture for farmers and ranchers, as it is a spiritual celebration of epic proportions. If there was ever a bucket-list gathering to attend in the Eastern world, the Pushkar Fair—with its vibrant display of camel decorations and religious significance—is it. The dates of the Pushkar Camel Fair are directly linked to the Hindu lunar calendar. This 14-day festival takes place around the auspicious full moon, the most prosperous time to absolve past sins. During this moon phase, locals bathe in the holy waters of Pushkar Lake, hoping their wishes will come true. The fair has two components: camel trading and religious rituals. The camel trading—which is the main attraction for tourists—happens at the beginning of the festival, with competitions and activities. Then, the focus shifts to the religious ceremonies. If you're going to Pushkar to see the camels (and other livestock), plan to arrive a few days before the start of the fair. The official fair dates each year mark the time when the government-sponsored cultural activities take place. However, camel traders usually arrive early and leave early, making the start of the festival the best time to view the animals in their elaborate decorations. This is also the best time to peruse the vendor tents (while free of crowds) that pop to form a makeshift city in the desert. The best way for foreigners to visit the fair is to go with an organized tour group. Tour groups receive special pricing at area hotels and attractions. If you book a hotel on your own, you may be surprised at the exorbitant prices of the lodging conveniently located near the fairgrounds. Still, some budget spots may offer good deals, if you don't need anything fancy. A few days before the beginning of the festival, camels, herders, and traders arrive to set up camp in the sand dunes. As the days progress, the arrivals continue, the gathering grows, and lively trading takes place. This is a great time to snap photos for your Instagram profile, as it's possible to move around freely and observe the scene. By the fourth or fifth day, the sand dunes are at their most crowded and the vibe is hopping with camels, horses, livestock, traders, and herders. As more people arrive in Pushkar, the festivities start to unfold. Camel races, competitions, like "the best mustache" and bridal competitions, and artisan activities take place at the fairgrounds. The atmosphere becomes lively with camel cart rides, vendors, musicians, gypsies, and tourists. Around this time, the camels and traders start disappearing back into the desert as their business concludes. The town of Pushkar also starts to swell—especially around the temples—during the prime fair days, as pilgrims arrive to participate in religious offerings at the fair. Official events for tourists continue at the stadium, and amusement park rides, folk dances, music performances, and other entertainment— including turban-tying contests—carry forward, entertaining visitors and locals alike. A few days preceding the full moon, the town is busy with pilgrims. Bhajans (devotional hymns) and religious ceremonies take place at the various temples around town. A religious festival honoring Lord Brahma (the creator) becomes the center of the celebration. And then, on the holy full-moon night, thousands of pilgrims gather to bathe in the lake and absolve themselves of sin, drawing the fair to a close. A grand finale of events includes a maha aarti (worship with fire) by the lake and a fireworks display.